To create something new from scratch is the toughest thing in the world. The view of the Cardiff-Chapter scene from a hundred mile distance is of a pulsating, unquenchable creativity. Many of the companies- Undeb, Give it a Name- are just that, names, to the Aberystwyth audience. When a company hits the A470, like Omidaze in 2012, it is good news. The Aberystwyth Studio lends itself superbly to the concept of “Spangled.” Its circular space is stripped of seating and allows the audience to move freely. Starburst lighting belts across the domed ceiling. The particular choice of timing in the year is admittedly not the greatest, with exams pending and the students’ May Ball about to happen. Mercury Theatre’s evocation of 1990’s club culture probably does not get the sweat, push and crush that would have been wished for. The music is courtesy of Jimpy and Phil Williams is choreographer. The energy of the cast is astounding. Sian Davies, in pink with a pair of dinky inflatable angel wings to match her name, is dancing when the audience is let in and guided towards Holly Fry’s coat-check girl Donna. Sian Davies’ dancing barely stops for breath for the next fifty-five minutes, and 1993 Clubland does not do slow. Physical theatre is about energy and movement and the word is subsidiary. But if words are going to be used, they might as well be good ones. Those in “Spangled” are not. The programme introduction indicates it is verbatim theatre “based on real life experiences of clubbers, DJ’s, promoters and nightclub staff.” But transposed speech relates to performance in the way that on-street vox-poppery relates to news journalism. It needs to be forced through a filter of distillation and focus. The writer for performance is not a holy presence, but the point is that she is not a performer. “Concentration destroys attention” is a byword in the acting book I wrote about this week. Performers are too close. The participant who has responsibility for the word does not just bring lines to be spoken; she imbues a piece with its inner architecture. “Spangled” has a narrative, but it does not have those inner correspondences, that accruing web of internal, self-referring complexity that moves high concept toward aesthetic purpose. As such, the company does not quite hit equally all four of the elements in its stated mission “developing Welsh talent…high quality, innovative and thought-provoking work”. 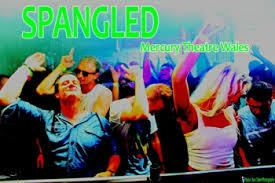 But a new company which explodes into being with a high-energy debut like “Spangled” is to be welcomed. The tour continues to Volcano 15-18 May, Newport Riverfront and Theatr Soar 23 and 25 May.